As always happens on this kind of visit we marvelled at the imaginative planting, the effort (and money) that had clearly gone into it, and its sense of being a little landscape, a world unto itself. 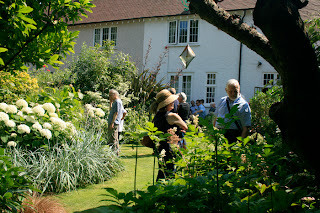 It was the private made public: cakes and marmalade sold from the kitchen, admiring glances cast at the hostas, warm smiles and 'excuse-mes' on the lawn from people who wouldn't make eye contact maneuvering their cars past one another in the car park at Sainsbury's. The gentleman owners were proud yet self-effacing, in the correct English manner. Around it Streatham shimmered like a mirage, most grass parched to straw, the streets smelling of monoxide and barbecue smoke. On the walk back home we passed a shuttered, derelict building, pushy immigrant buddleija already colonising the cracks in its walls, pioneer weeds and wildflowers making their eager way up its rusting fire escape.